WebVR support is a work in progress for the Chromium project, which could one day change how we browse the Internet. Reading your favorite website may be a whole new experience in the near future. As part of its Chromium project Google is apparently working at bringing virtual reality support to its browser. There’s an an experimental flag found at chrome://flags/#enable-vr-shell that enables a browser shell for VR. He offered a peak at how this could look with 360-degree videos. Virtual reality is likely to gain wider traction with Google’s browser. Daydream is Google’s upcoming virtual reality platform, which we got to see for the first time at Google I/O this year. Cardboard is the low-rent VR option that transforms your phone into a VR headset with a viewer that follows Google’s guidelines. This work by Google should spur the web’s ability to work with virtual reality. While the Samsung browser can visit sites in the company’s Gear VR headset, the experience right now is a little clunky. Why this matters: Bringing VR to the web is a pretty hefty project, and we’re just at the very early stages. 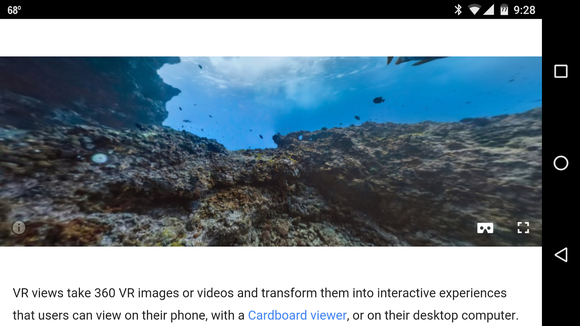 If anyone can transform Chrome into a virtual reality-friendly platform it’s Google, which is behind the very popular browser. It’s an evolving effort that should take shape more clearly as we get closer to an official launch of Daydream and VR hardware from Google.